Cort the Sport: Is interest in swimming waning? Our local pool is closed this week for maintenance so our swim group is on hiatus. Swimming still needed to happen though so I headed to the Christiansburg Aquatic Center, the 50m x 25y competition pool one town over, about a 15 minute drive from my house. We'd had a home football game the night before, where our Virginia Tech Hokies lost badly to Ohio State. At 7 am, with most of the town sleeping/crying off the game, this giant pool had exactly one person in it. One. I doubled the number by jumping in, but my fellow swimmer left and it was just me for a while. 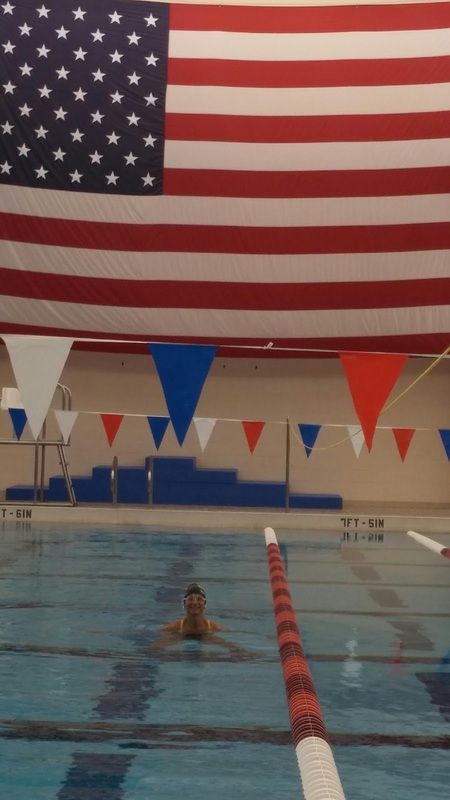 I was mesmerized by the giant flag at the end of my lane. As I swam, I thought about the flag and my upcoming races, but mostly I thought about how great the water felt. I also wondered why swimming isn't a more popular activity among adults in our town? I spoke with Chrystal Jones, Aquatic Center supervisor, who took the photo above. We got to talking about the oddly empty pool and our common desire to promote swimming among our adult population in the community. Our kids' program, H2Okies, is large, strong, and successful. There's no reason a corresponding adult program couldn't be too! We have an intelligent, fitness-oriented population. 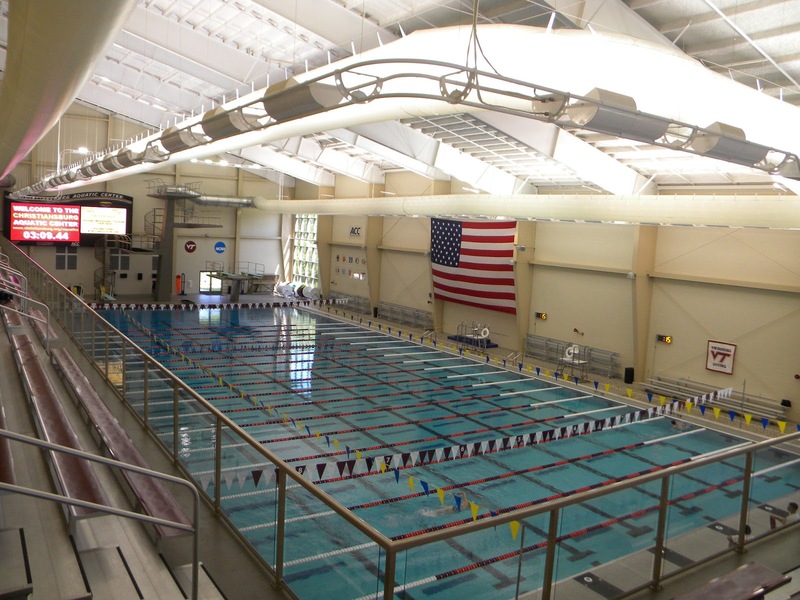 We have multiple pools including this state-of-the-art competition and recreation facility. We have talented coaches and swimmers. It just seems like our swimmers like to do their own thing on their own schedule. It's a shame because there's so much more fun to be had in a group setting, not only during the swim session, but also with the chatter before and after! Perhaps group swimming has a bit of an image problem. It is often seen as two ends of a spectrum - as a relaxed splash-around social activity, or as an intensely disciplined competitive sport of fractions of a second. But there is plenty of middle ground where one can learn to really enjoy the feel of the water and appreciate and improve upon the nuances of one's body balance, position, and movement. Yes, that still means sets and laps and some time goals for fun but the variety is what makes it interesting. And when you learn to let the water support you, and you get that sensation of lying balanced across the surface, gently flutter kicking, reaching, and pulling through it, it's an amazing sense of capability that is different than what one gets from the bike or run. It's almost artistic in a sense. I fear that interest in swimming may be waning. I was excited to hear from her the the county school system is going to be instituting a program to teach all second graders to swim (I think I have that right). Where I grew up, we had a pool in our High School and swimming was part of our gym class (which I hated at the time). Meanwhile, in neighboring Roanoke, I read that several of their public pools are in danger of closing due to lack of use. I'd like to see a resurgent interest in pool and open water swimming. I'd like to see master's programs bursting at the seams with morning, mid-day, and evening options to suit all schedules. I'd like to see regular open water swim practices and races in our region's lakes (Claytor Lake, Smith Mountain Lake, Lake Moomaw). Nothing drives home the importance of fresh, clean, water like swimming in it. Key to protecting this critical natural resource is public understanding that water doesn't come from a store, a tap, or a hose. It comes from the natural bodies of water around us! With swimming we are reminded of our interconnectedness with water. There are so many reasons to jump in and get swimming - especially with a group!